The Mayfield West campus of Renew Church in Ontario, Canada (Bartley Sawatsky, lead pastor; Wade Rininger, campus pastor) started around the same time as Butter and Cup, a local coffee shop and bakery run by Mike and Genevieve Amaral, who attend Renew Church. The partnership is unique – instead of putting a coffee shop in the campus of their church, like many churches, Renew aims to use the business as a “third space” –common ground where people who might not be comfortable in a church setting can feel at home. 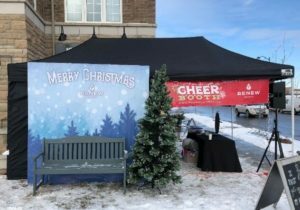 For four hours on Saturday afternoon in December, customers and passersby alike are met with a warm, welcoming tent, full of games, prizes, Christmas music, and volunteers in festive hats who will wrap presents for free. People who stop in will get an invitation to the Christmas Eve service, and, depending on how their luck settles, a “dad joke,” a lump of coal, or a gift card. Rininger says it isn’t as much about inviting people to their church as it is practicing spreading the joy that knowing Jesus brings. And it’s working. 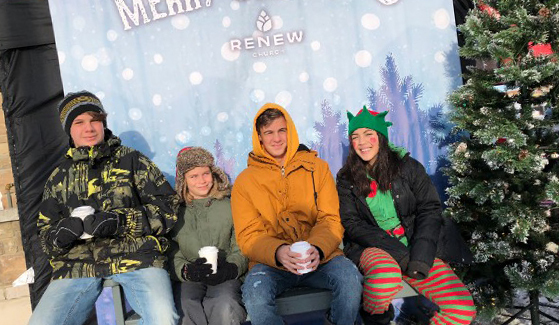 People who walk by find the tent emanating warmth – both from the space heater and the smiles on the faces of the volunteers from Renew Church. It all fits with the church’s theme – a joy-filled Christmas, and with Renew’s larger aim as well. Click here to send a note of encouragement to Pastor Wade and the team behind the Christmas Cheer booth.